In 1938, MGM producer Arthur Freed chose “Babes in Arms” as his first project as a producer and the ideal property to co-star Judy Garland and Mickey Rooney in what became the first of four “Let’s Put On A Show” musicals. The film was released in late 1939 and was a smash hit in spite of the fact that “I Wish I Were In Love Again, ” “My Funny Valentine,” “The Lady Is A Tramp” were all deleted from the score. Judy recorded a solo studio version of “I Wish I Were In Love Again” for Decca Records on November 15, 1947. She also recorded the song as a duet with Mickey Rooney in 1948 for the Words and Music soundtrack. That film (and the MGM Records soundtrack) also featured her only studio recording of “Johnny One Note.” Likewise, she never recorded a studio version of “Always” and as best as we can tell she never performed the song on the radio again. 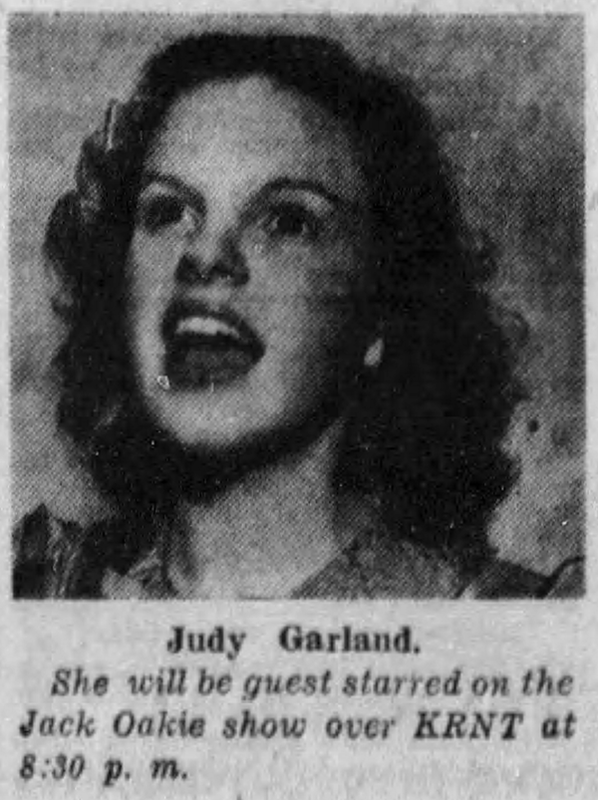 Judy reprised “Johnny One Note” on the June 15, 1937, edition of “Jack Oakie’s College.” No recording of that show is known to exist although it’s likely that Judy sang the arrangement heard here. These previously unreleased recordings were premiered on The Judy Room’s YouTube Channel in 2017 and early 2018, thanks to the generosity of collector John Newton. Thank you, John! 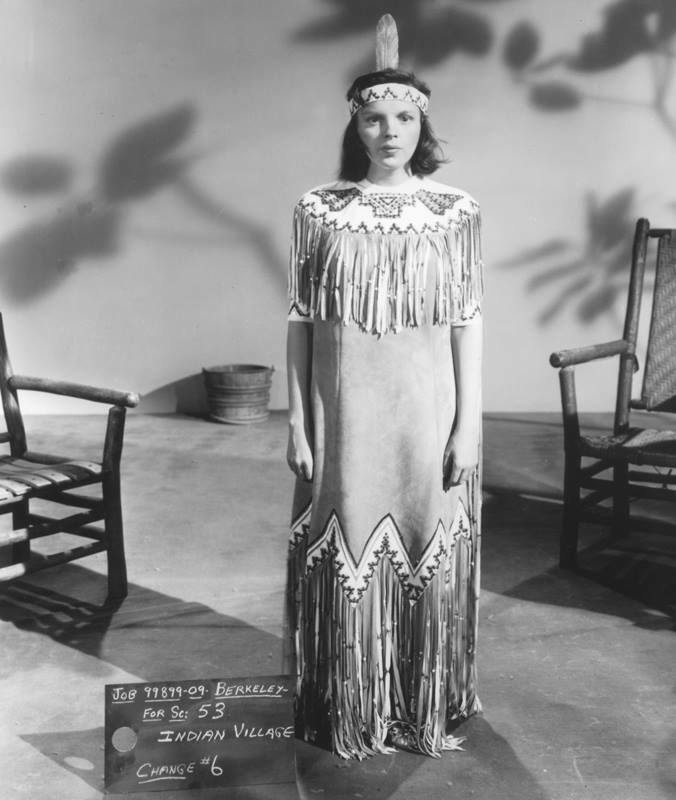 When Judy Garland appears in “Ziegfeld Girl,” she will be making her debut as a prima donna. 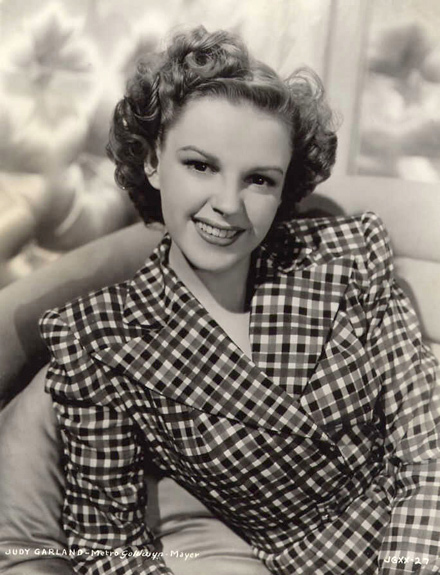 For while she has had singing roles in pictures before, including “Babes in Arms,” “Strike Up The Band,” and “The Wizard of Oz,” in “Ziegfeld Girl,” she will have her first really grown-up part in a musical whose cast is headed by James Stewart, Hedy Lamarr, Lana Turner, Tony Martin and herself. One of her songs, “Minnie From Trinidad,” will be rendered in the Ethel Merman manner. She resembles the singer, in style an personality, according to Roger Dens, who wrote the song and has coached both stars. 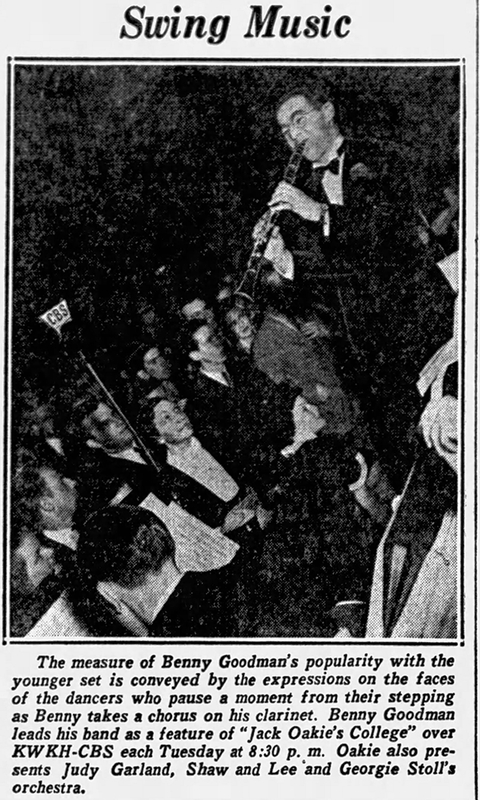 She will also sing a medley of tune with Tony Martin, and a number called, “Laugh, I Though I’d Split My Side,” with Charles Winninger. April 20, 1943: Filming continued on Girl Crazy specifically on the “Interior Assembly Hall” set (the “Embraceable You” number and surrounding scenes). Time called: 10:00 a.m.; Judy arrived at 10:25 a.m.; dismissed: 5:50 p.m.
April 20, 1944: Decca Records session at the Decca studios in Hollywood, California. 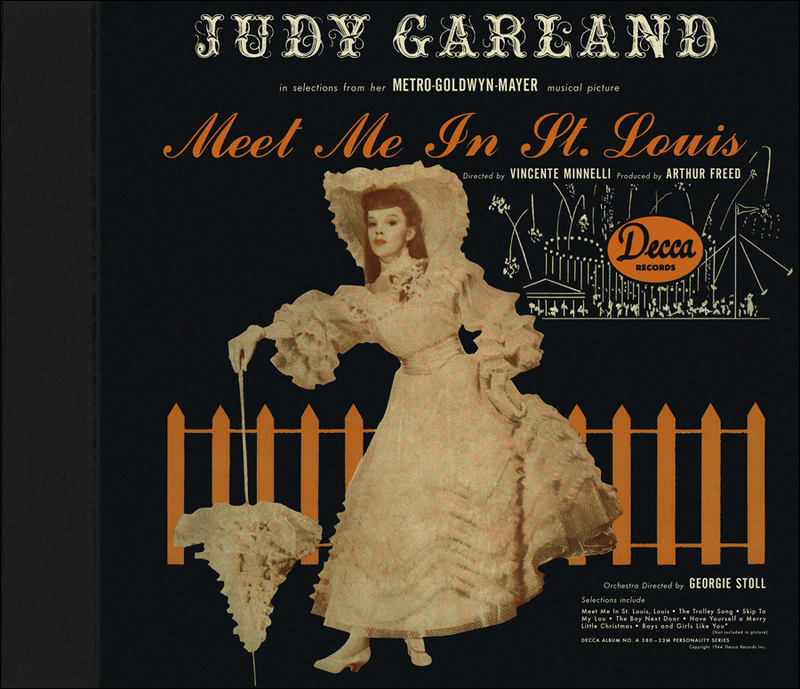 This was the first of two sessions during which Judy recorded studio versions of songs from Meet Me In St. Louis for the label’s “cast album” of songs from the film. On this day she recorded these three songs in the following order: “The Boy Next Door”; “Boys And Girls Like You And Me”; and “Have Yourself A Merry Little Christmas.” The album was released on November 2, 1944, and reached the #2 spot on the new “Album” chart. April 20, 1945: Filming continued on The Harvey Girls. Judy and the cast were on the “Exterior Picnic Grounds” set filming the ending of the “March of the Doagies” number. The entire production number spanned the “Interior Harvey House” set, then moved to MGM’s Backlot #3 (the “Western Street”) then back to a soundstage for this set, which featured the “Judy on fire” ending of the number. After all that time and expense, the entire sequence was cut from the film. On this day Judy had a 10:00 a.m. call to be on the set, she arrived at 10:40 a.m.; dismissed at 6:10 p.m. The photo below, taken on this day, was provided by Kim Lundgreen. Thanks, Kim! 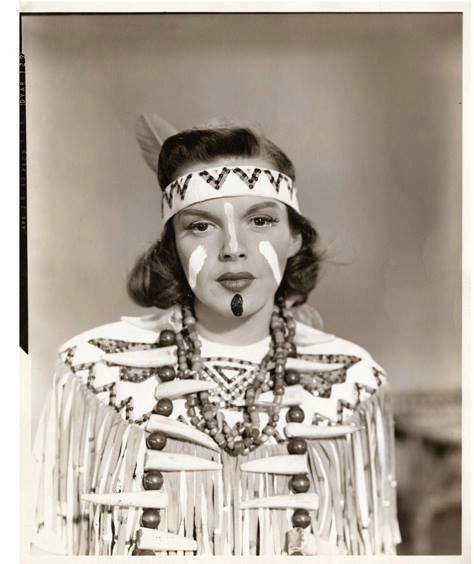 April 20, 1949: Judy posed for these wardrobe and makeup tests for Annie Get Your Gun on Stage 4 at MGM. Judy was due in makeup at 10 a.m. then due on the set at 11 a.m., arriving at 11:10. 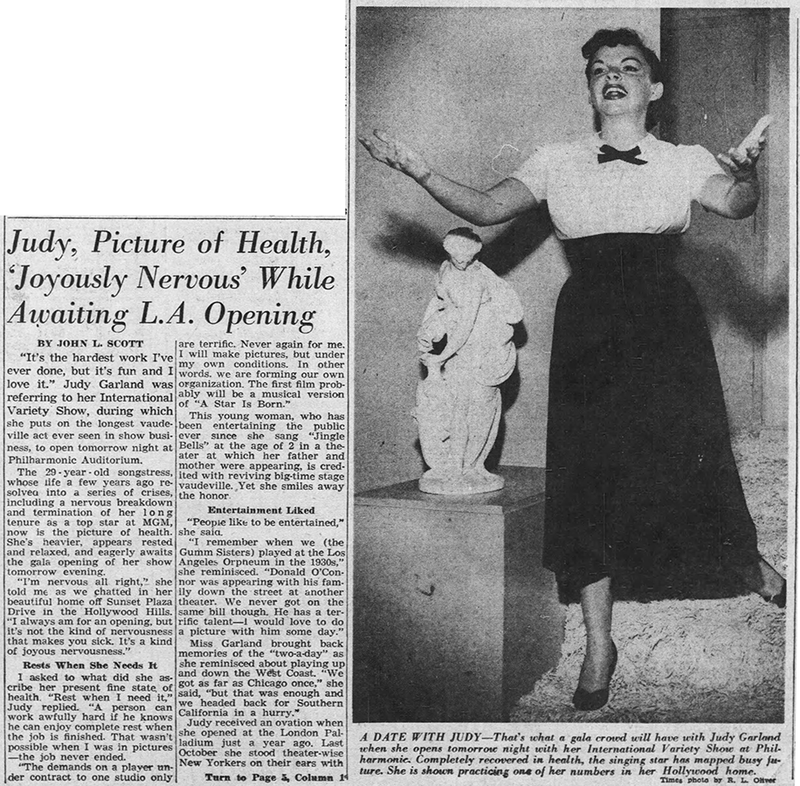 Lunch was from 12 – 1 p.m.; dismissed at 5:20 p.m.
April 20, 1952: Judy was anxiously awaiting her return to the Los Angeles stage after her already legendary successes at the London Palladium and The Palace in New York. Los Angeles was home for Judy and is where most of her peers were. She was understandably nervous but of course, her opening night at the Los Angeles Philharmonic Auditorium was another smashing success. 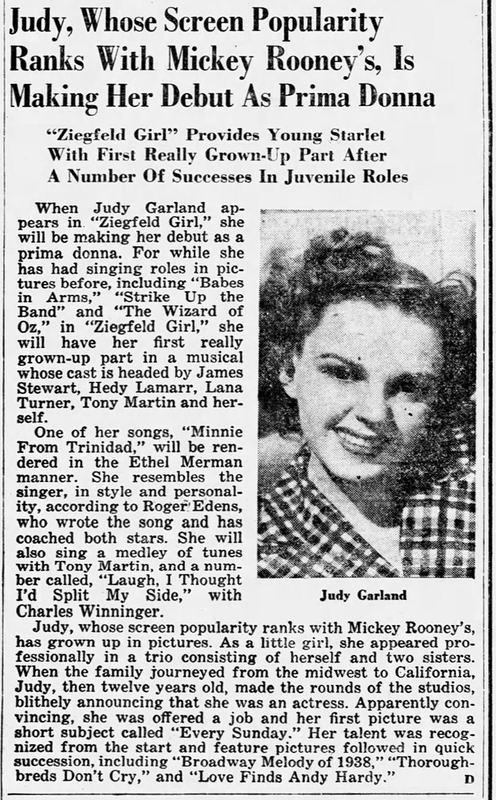 This article by John L. Scott for the Los Angeles Times documented the new Judy and her new life. “It’s the hardest work I’ve ever done, but it’s fun and I love it.” Judy Garland was referring to her International Variety Show, during which she puts on the longest vaudeville act ever seen in show business, to open tomorrow night at Philharmonic Auditorium. The 29-year-old songstress, whose life a few years ago resolved into a series of crises, including a nervous breakdown and termination of her long tenure as a top star at MGM, now is the picture of health. She’s heavier, appears rested and relaxed, and eagerly awaits the gala opening of her show tomorrow evening. This young woman, who has been entertaining the public ever since she sang “Jingle Bells” at the age of 2 in a theater at which her father and mother were appearing, is credited with reviving big-time stage vaudeville. Yet she smiles away the honor. “People like to be entertained,” she said. Judy received an ovation when she opened at the London Palladium just a year ago. Last October she stood theater-wise New Yorkers on their ears with her one-woman show at the venerable Palace Theater, former paradise of vaudevillians. In International Variety Show, Judy takes over the second half following some top-notch vaudeville acts and, assisted by an agile male partner, works solidly for an hour. 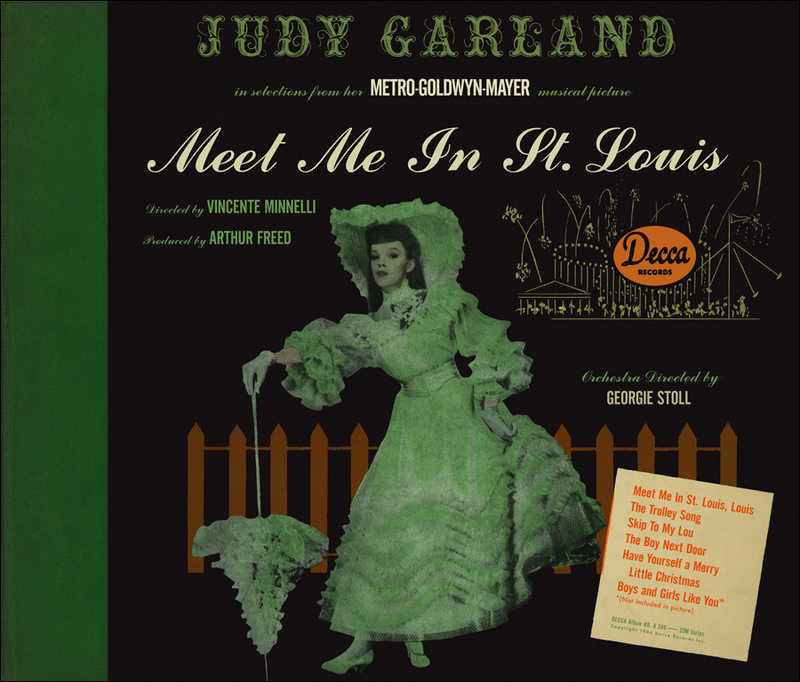 Songs that Judy sings as no one else can include “We’re a Couple of Tramps” [sic] from the film “Easter Parade,” “The Trolley Song” from “Meet Me in St. Louis,” “The Boy Next Door,” “You Made Me Love You” and, of course, the topper, “Over the Rainbow,” which invariably brings mingled cheers and tears. Since Judy’s return to health and her smash hits in London and New York, she has been deluged with stage and film offers. From the way she talks, however, the stage will get first call. Judy recalled how, on opening night in New York, she almost came a cropper. We asked whether television figured in the star’s plans. Beside stage and movies, Miss Garland has a contract to record for Victor. This she probably will do in New York, and because her activities will be divided between East and West she has purchased an apartment in New York. “Well,” the actress sighed, “here we go again. So many different things have been written about my becoming the wife of Sid Luft, and so many dates have been guessed at, that I’ll just say I don’t know when, at this time.” She added, however, that when the Los Angeles and San Francisco engagements have terminated, she and Mr. Luft may arrive at a date for the wedding. 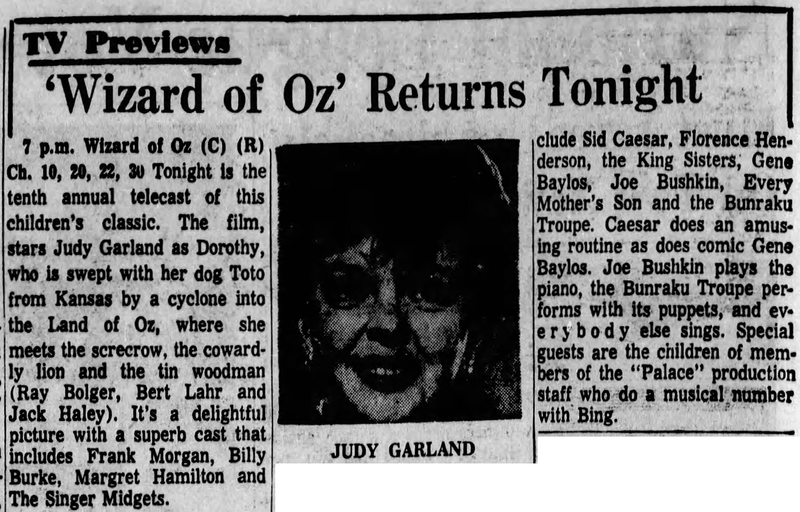 April 20, 1958: Judy’s upcoming return to her birth state, Minnesota, was covered by the “Star Tribune” out of Minneapolis, which is where she performed on May 11, 1958, for the state’s centennial celebration. It was her last time in Minnesota. 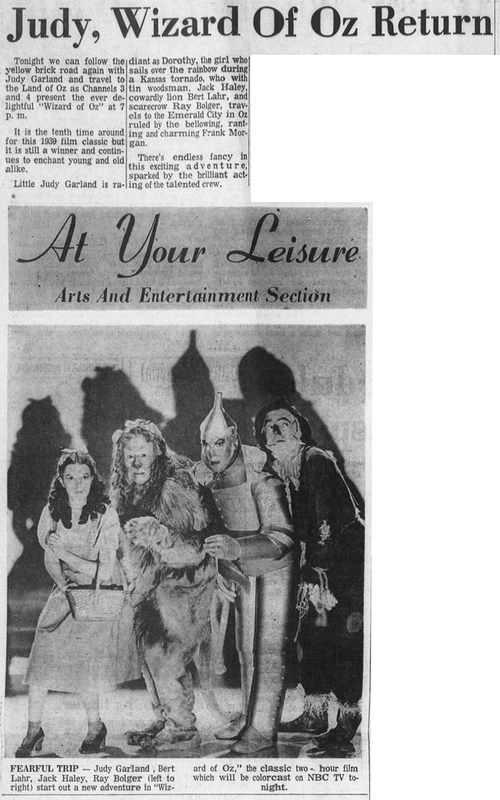 April 20, 1959: Here’s an ad for Judy’s upcoming appearance in Baltimore, Maryland, on April 27th. The prices may seem low by today’s standards but at the time they were moderately priced with the $6.50 seats costing $57 in today’s (2019) money. 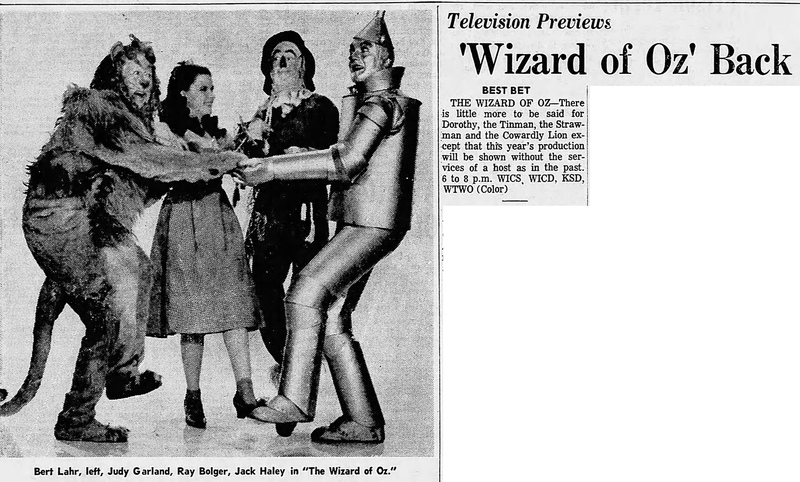 April 20, 1968: The Wizard of Oz was broadcast on the NBC network for the first time after moving from its previous “home” at CBS. 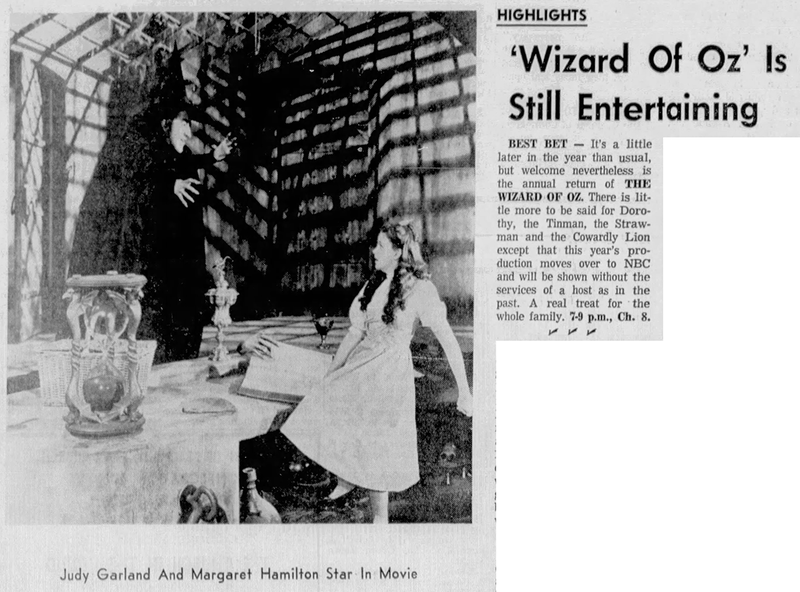 This was also the first time that the film was aired without a hosted introduction. 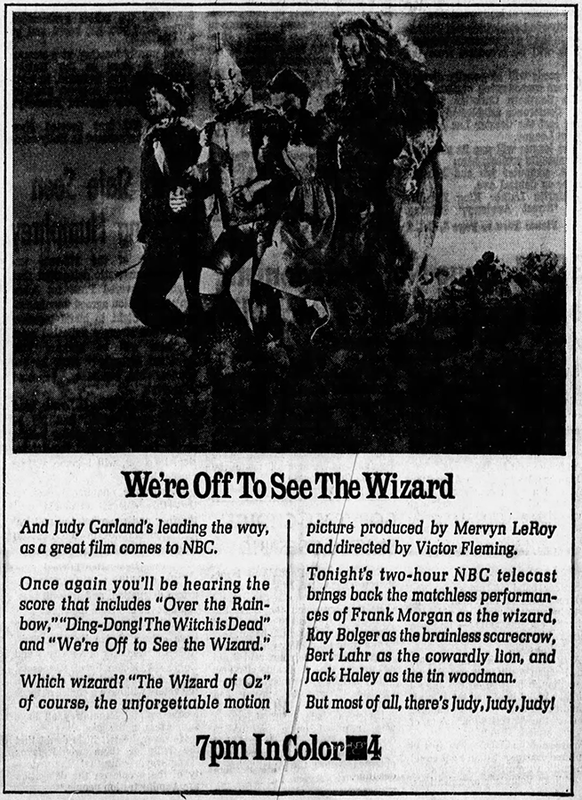 It returned to CBS in 1976.